I’m a bit of a fan of quotes from Alice in Wonderland…this one seems very apt in these strange times when nothing is certain. 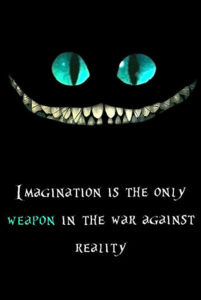 Give me imagination and the ability to create a world I’d prefer to live in any day than the reality. It’s only now I understand why my grandmother preferred her rose tinted glasses. And this could be Pootie on a bad day!